This account is based on the book “Emancipation,” by Michael Goldfarb (Simon & Schuster, 2009). Edgardo Mortara, age 6, was the son of a Jewish merchant in Bologna, the fourth of six children. As a baby he became seriously ill, and the family’s 14-year-old housemaid, Anna Morisi, “baptized” him. She took a small glass of water, sprinkled it on the baby’s head, and said the holy words. To her, it was an act of kindness – in case the child died. Some years later, Morisi told a friend what she had done. Edgardo Mortara, right, became a priest in the Augustine order. Here he is with his mother and an unidentified man. On the evening of June 23, 1858, police came to the Mortara apartment and seized Edgardo. They took him to the Convent of San Domenico, where the local representative of the Holy Inquisition had his office. To the church authorities, Edgardo had become a Catholic and therefore could not be raised by Jews. This wasn’t the first case of its kind; during the previous decade, a number of Jewish children in Italy had been secretly baptized and taken away from their parents. Edgardo’s mother, Marianna, upon learning the news, had a mental breakdown. The boy’s father, Momolo, spent a day searching for his son, then was found unconscious in a street. Eventually the father learned that his son had been taken to Rome and was lodged in the House of the Catechumens. Momolo went to the ghetto in Rome for help, trying to get access to his boy. For a few months, the parents were allowed supervised visits with their son; then all contact was closed. The plight of the Mortara family became a political issue. France wanted the boy released. The case became an international cause celebre. Forty rabbis from Germany petitioned the pope for the boy’s release, without success. Jewish leaders tried to persuade Protestant clergymen to have Protestant countries pressure the Vatican. “The situation quickly turned into a public relations disaster for the pope,” writes Goldfarb. Sir Moses Montefiore, 74, a respected member of the Jewish community, went to Rome; neither the pope nor his secretary of state would meet with him. Eventually the secretary of state did meet with him – and told him that Edgardo was now a Catholic and the pope was his father. “End of discussion,” Goldfarb wrote. In 1870, when the Vatican’s authority became weakened, Mortara went to Rome to look for his son – whom he had not seen in 12 years. Edgardo was now 19 – and studying for the priesthood. He fled Rome to avoid meeting his father. 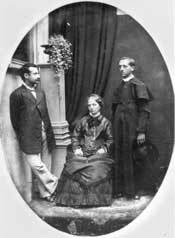 Mortara was living on the charity of the Rothschild family and other Jews. Falsely imprisoned for murder, he spent six months in prison, and died one month after gaining his freedom. Edgardo, now Father Pio Edgardo, was eventually reconciled with his mother and attended her on her deathbed. He died, in fact, mere months before the Nazis invaded Belgium. In the opera, he dies just before the Nazis come to his monastery to arrest him and to deport him.